Our workshops this year focused on the industrial culture that thrived on Mashapaug, primarily the Gorham Silver Manufacturing Co. that played a vital role in the development of Providence and American Decorative Arts until 1967, but unfortunately left heavy metals and chlorinated solvents in the ground water and thus the pond. 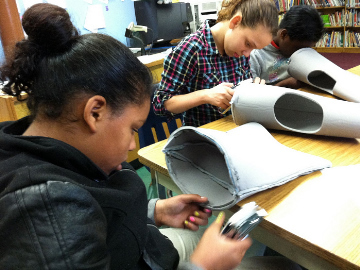 Eighth grade students worked in art classes with Holly and Artist Joan Wyand from the Steel Yard to design a metal floating sculpture for Mashapaug Pond. Their design is informed and inspired by Gorham Silver Manufacturing's environmental and design legacies. Joan then translated the design into a steel sculpture that was unveiled at the 2012 Procession. In the girls' science class they learned about the various materials used to make Gorham products, including tin, copper, silver, bronze, chlorinated solvents (cleaning agents) and arsenic (an alloy). They were introduced to some of the Gorham processes including smelting (melting down of waste metals from the foundry to glean silver), and electroplating used to coat less expensive metals with a thin coat of silver. Many of the by-products of these processes, such as lead, dioxin, arsenic, volatile organic compounds and PCB's are found in the soil, water and in some cases the fish of Mashapaug. Finally the girls were shown maps of excavation and capping plans for areas of the former Gorham site along the edge of the Pond. Next, Gorham archivist Sam Hough visited the school and narrated a 1927 Gorham promotional silent film for the entire school giving the students and teachers a real sense of the Gorham process from artist rendering, bronze casting, rolling out silver for flatware stamping to cleaning and polishing. 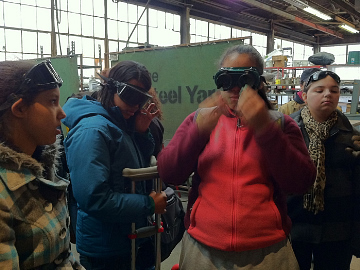 The girls visited the Steel Yard twice--once to tour the facilities and observe welding techniques with the guidance of Public Projects Director Howie Sneider and Artist Monica Shin, and once to observe the sculpture in process and hand paint the flowers to be attached. Gorham factory production near Mashapaug Pond in Providence, Rhode Island, has left the air, land, and water diseased with toxins and poisons. It's been years since the Gorham factory has been in business, but its damage has been left behind . The air, land, and water are toxic and unhealthy. People are prohibited from swimming in or drinking from the water, where the fish suffer from disease. 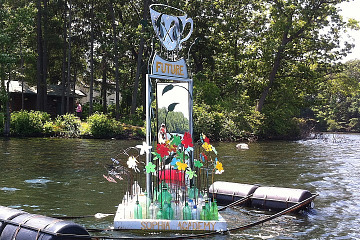 In an effort to raise awareness and support the movement to clean up the area, the Sophia Academy eighth grade class of 2012 has designed this floating sculpture. As part of our art and science curriculum, we twisted wire sculptures, drew sketches, and molded clay to come up with a final model. Our sketches and ideas were realized in collaboration with artists at Providence's Steel Yard. The sculpture is made of steal, oil paint, plexiglass, and recycled materials. The sculpture carries dying, diseased flowers on one side to represent Mashapaug's past, and holds healthy, bright flowers on the other to show the pond's future. On the top of the sculpture sits a piece of hollowware to represent the Gorham factory. The theme of the sculpture is simply the progression from the past to the future. Our goal is to have people recognize and appreciate our work, while learning more about the pond and its history. We hope that the sculpture will influence people to help clean up the pond and support efforts at air, land, and water restoration. It was my pleasure to work with the Sophia Acadamy's 8th grade class on the Urban Pond Procession floating sculpture! 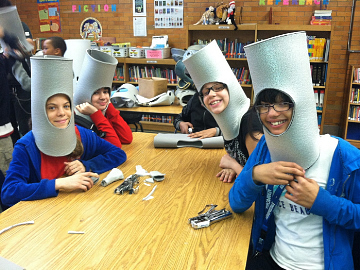 Environmental awareness and collaboration are large parts of my creative purpose. I enjoyed seeing the students develop their individual ideas through drawing and making ceramic models. We combined their favorite elements into a few large drawings. I drafted three final sculpture designs, and the girls voted on their favorite. The sculpture and floatation pontoon was collaboratively fabricated at the Steel Yard by Meredith Younger, Howie Sneider, and myself. I am excited to have been a part of this unique project, and look forward to it unveiling this weekend! 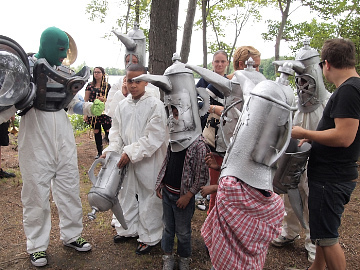 Students in After School Arts at Reservoir Avenue Elementary (Mashapaug Pond's local public school for grades K-5) worked with members of Big Nazo to create costumes based on Gorham Silver Manufacturing flatware and hollowware designs. UPP founder Holly Ewald grounded the students in Gorham history, environmental basics, and the rich cultural contexts of Mashapaug Pond. 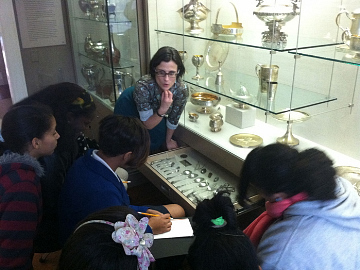 These 4th and 5th graders got a first hand view of silver flatware, teapots, candy dishes and vases designed by Gorham at the RISD Museum. Aware of the lush decorative work on the Gorham pieces, students embellished their teapot heads with stars, hearts , leaves and flower shapes. On procession day they suited up with white hazmat suits and their silver teapot heads and danced to the beat of Extraordinary Rendition Band and What Cheer? Brigade. 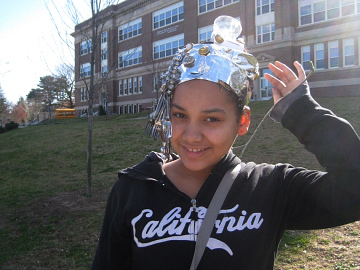 UPP teaching artist Lisa Melmed worked with students in Gilbert Stuart Middle School's AfterZone to make Gorham-inspired vessel hats. She drew on teaching materials and research produced during the Exploratory Workshops that UPP offered to interested artists, teachers and citizens earlier this year. The workshops helped them ground students in the environmental and cultural history of Mashapaug Pond. 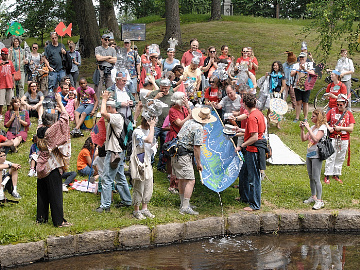 The resulting vessel hats were worn and carried water in the 2012 Procession, bringing attention to the connectivity of water and the vital importance of clean water to all communities, global and local.